Whispers in the Loggia: "The Word Meets Us... It Also Judges Us"
"The Word Meets Us... 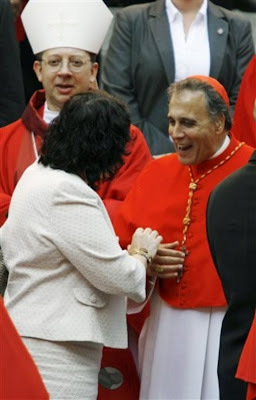 It Also Judges Us"
Sure, it might've been a bit less free-flow than his last big Capital turn, but below you'll find the text of Cardinal Dan DiNardo's homily at yesterday's Washington Red Mass. Six weeks before assuming the reins of the US bishops' top policy portfolio, Texas' ranking prelate was captured following the annual liturgy greeting the Supreme Court's newest member, Associate Justice Sonia Sotomayor, the first-ever Latino named to the top bench and the sixth Catholic on the nine-member Court, a milestone likewise without precedent. Celebrated each year on the eve of the Court's new cycle, Sotomayor was one of six Supremes in attendance at yesterday's Mass, leading an A-list congregation that included Vice-President Joe Biden, two Cabinet secretaries, and a capacity crowd of Federal officials, judges and lawyers.